Having looked forward to GTA V on the PS3 way back when for months, and playing it for months after that, I was actually pleased (and unsurprised) that it was being re-released on to Next-Gen. The game with seven world records certainly deserved the remastered treatment, and personally it’s worth every penny. GTA V is absolutely incredible. Developed by Rockstar North and out now for Playstation 4 and Xbox One, GTA V is an action-adventure game, with players controlling three characters throughout the story mode, each with different linear scenarios and set objectives. The story mode is packed with entertaining characters and missions, and with the three story lines of Michael De Santa, Trevor Phillips, and Franklin Clinton meshing together throughout the story mode, it keeps the player hooked with the interchanging style of missions. With the graphical enhancements and the constant 30fps making the game a lot smoother than I remember, it’s been a lot more enjoyable playing through the story again. The visual difference between the current and last-gen is noticeable, and makes the whole experience a lot smoother and easier on the eye. The draw distance is incredible as well – it’s great playing a GTA without seeing buildings load up just ahead of you. However, it isn’t all about the visuals when it comes to games, but even the gameplay feels better in the newer version. Los Santos also feels a lot more populated than it did on the last-gen version, as there’s way more traffic on the roads and more people walking around the streets. When walking through the streets, you can hear the odd sentence from random people’s conversations, and it makes Los Santos feel more alive than other cities included in games. 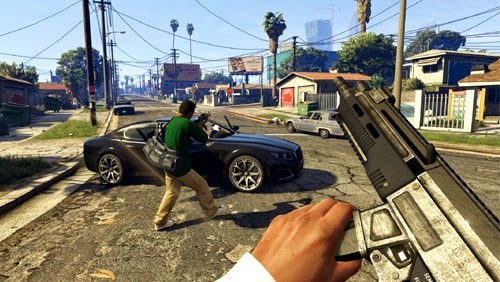 One feature that the majority of people have been looking forward to is the “First Person Mode” in GTA V. I’ll admit; I still prefer the third person view as I sometimes feel that the first person mode is quite clunky at times, and I prefer seeing what’s behind me. However, driving in first person mode is a lot of fun and personally easier, as weaving through traffic is a lot easier. There are also numerous other additions to the game – although they aren’t realistically the biggest of additions. In offline mode, you can consume (if you can find it) Peyote, a small cactus. Michael, Franklin, and Trevor can consume these and take on the form of an animal until said animal ends up dying/you decide you’ve had enough of roaming the streets as a pig. I must admit, I had no idea it was added until I was driving up to the top of Mt. Chiliad, and the prompt to eat one popped up. Five minutes later I’m flying around as a Seagull shitting on people. It is a small yet fun addition to say the least. If you’re still debating leaping to the newer version because you’ve sunk so many hours into the 360/PS3 version like I did, Rockstar has your back. You can transfer your character over, even if you’re switching sides and going from 360 to PS4! Other additions include new cars, weapons, updated radio playlists, and numerous updates to the multiplayer. The multiplayer has probably received the most additions and tweaks in the newer version. You can now free-roam in a 30 player lobby opposed to a lobby capped at 16, as now there’s even more people trying to sticky bomb your personal vehicle or run you over when you spawn in. One of the more popular modes in the online was the racing, and custom races can now be double the size with an increased amount of items at your disposal. Not to mention Heists are finally around the corner, having been delayed since the first release of GTA V way back in September 2013. Getting in a team with your friends to rake in the money will probably overtake the fun in racing 24/7! Overall, the enhanced visuals look fantastic, but the most impressive thing is how every small addition makes Los Santos a more immersive open world than it was on last-gen. The story mode is brilliant and keeps the player interested with the three different story lines all intertwining at some point. The online is still amazing, and the highly anticipated (and delayed) heists will be added in the coming weeks! The only thing I could say is that there isn’t a huge deal of new content, but if you’ve never played it before/loved playing it, personally it’s still worth every penny. GTA V was already a masterpiece, but the newer version is even better and I can’t recommend it enough. GTA V is absolutely perfect and receives a 5/5.